It’s been a little while since I’ve given a full homestead building update. It’s slow-going during the winter when we’re both teaching during the day, so what have we been able to accomplish? 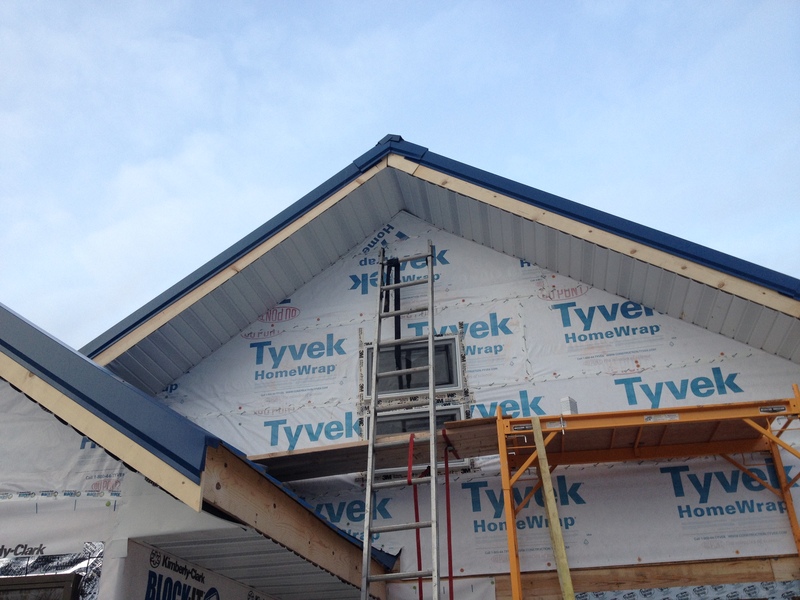 The biggest, highest priority job was getting the soffits and flashing done. 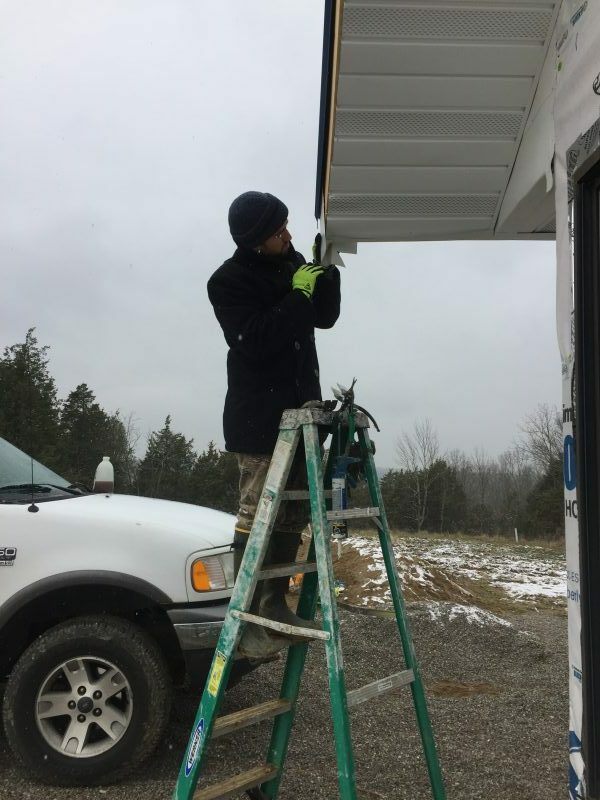 Mark had started the soffits in the November-December update but because of holidays, school, and odd weather his ability to get out and work was pretty dramatically hindered. That’s what happens when life gets in the way. I want to give a big, public, mushy thanks to Mark for doing just about all of the work you see in this update. 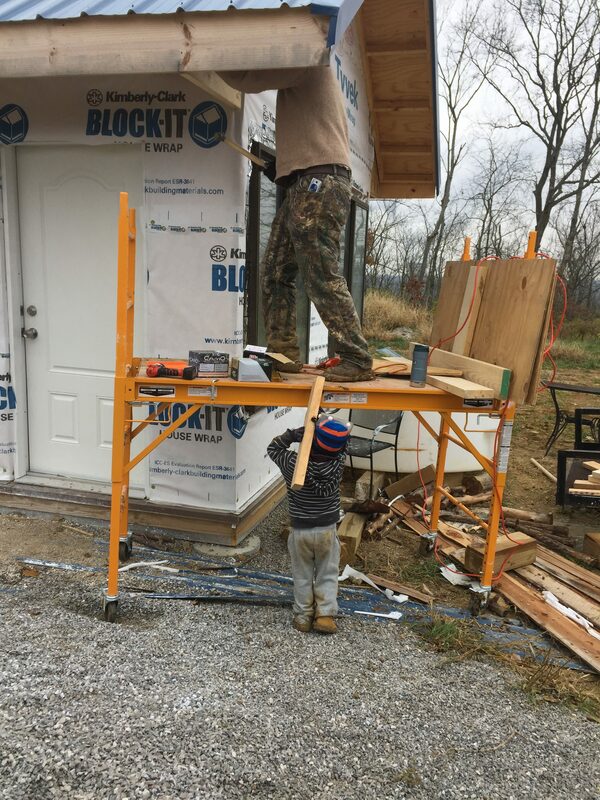 I mean, I helped move some scaffolding sometimes and picked up nails if he dropped them, but I basically wasn’t able to help at all. It was pretty sad for me because I love getting out and working with my hands to build this house. That’s why getting my hands dirty building with cordwood was so fun for me! The trade-off was that I got to spend more time with our son. The fall semester was so crazy busy for us that our Little Man started getting really clingy. His behavior was all over the place and we could tell that the schedule we were keeping with trying to finish the cordwood was just too much for him. 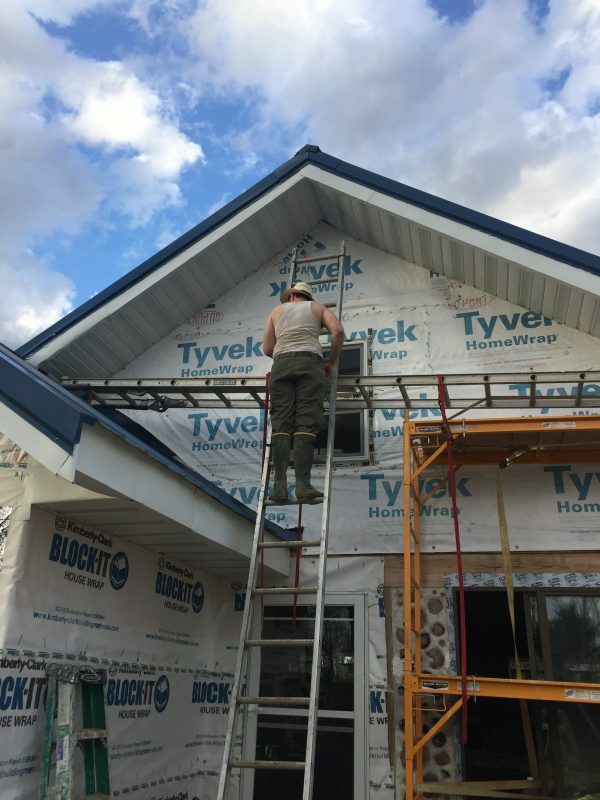 For the sake of our family and our little guy’s well-being, I stayed home while Mark did the [apparently very boring] work of putting on the soffits and flashing. 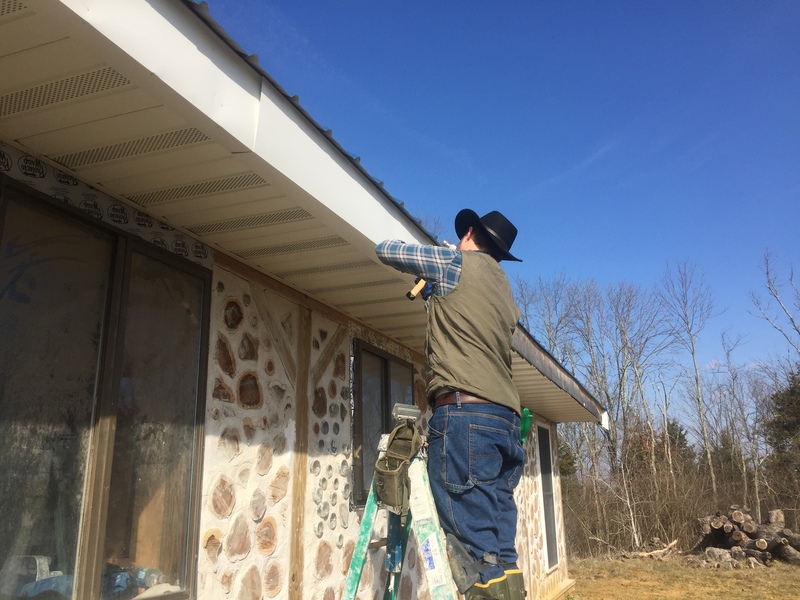 Soffits are what enclose the gap between the end of the roof and the walls of your house. They also provide needed ventilation to the attic space. 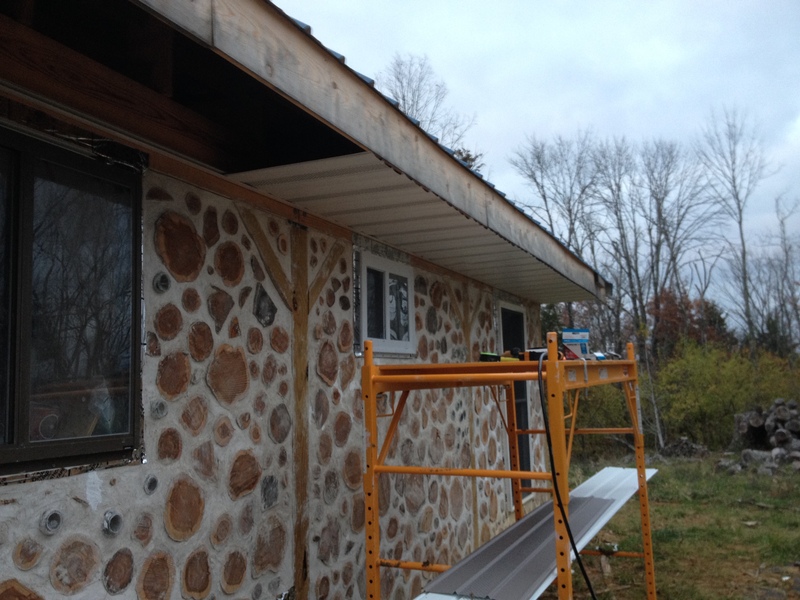 Most standard homes have a 12 inch soffit, but as I’ve addressed in regards to cordwood best practices our roof overhangs are 24 inches. 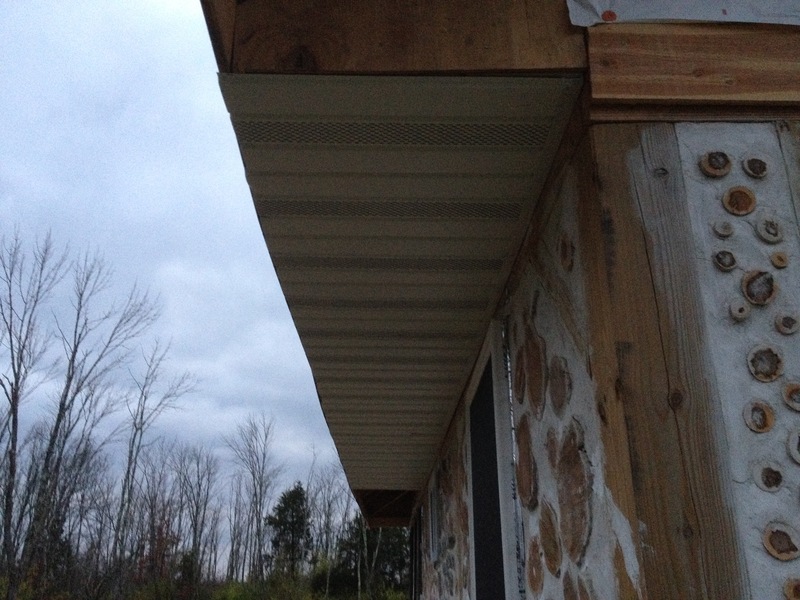 Soffits typically come in big strips about 12 feet long and 12 inches wide. Obviously we needed a 24 inch width but we couldn’t just run two parallel strips. 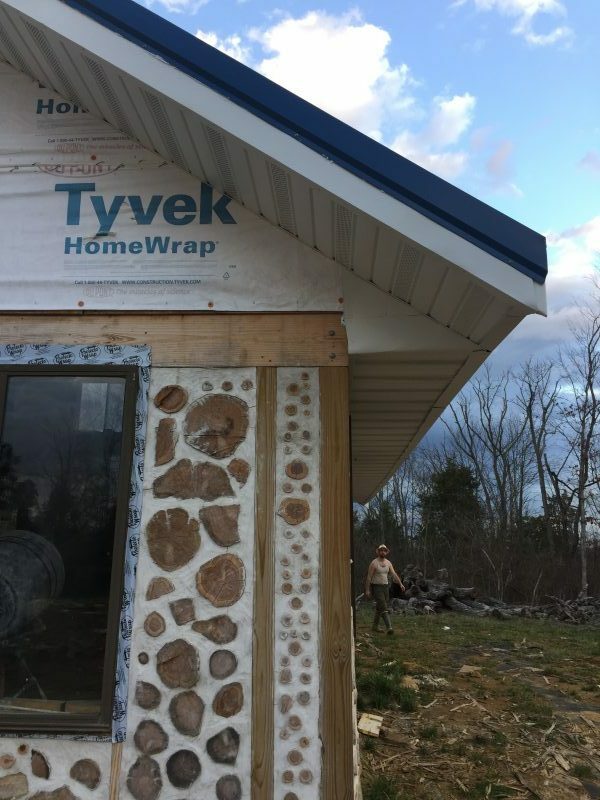 Mark’s solution was to cut these long strips into 24 inch segments and lay them perpendicular to the house within a J-channel. The progression of ladders. I’m so glad he was willing to do all this because I REALLY don’t like heights. 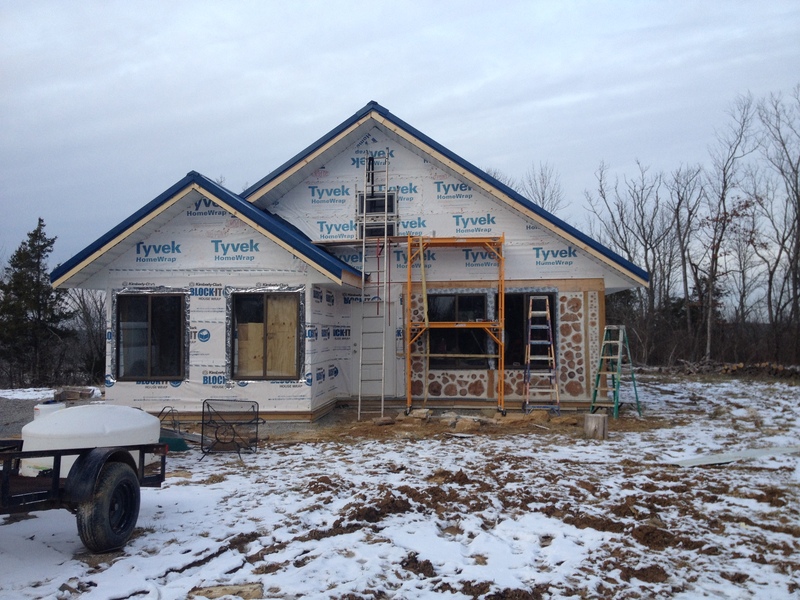 Note the unfinished soffit in the background and the finished soffit in the foreground. Neither have the flashing to cover the edges at this point. 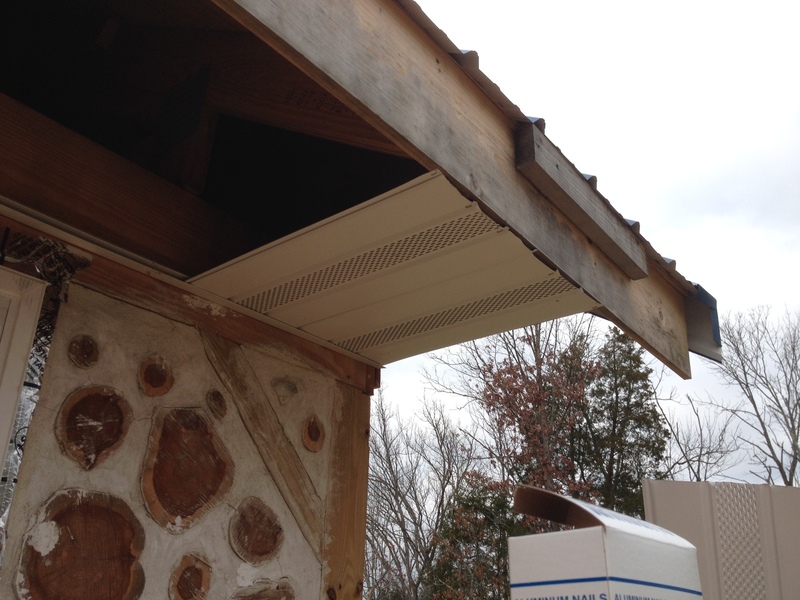 From there he put on the flashing that covers the wood edge of the roof and encloses the soffits. 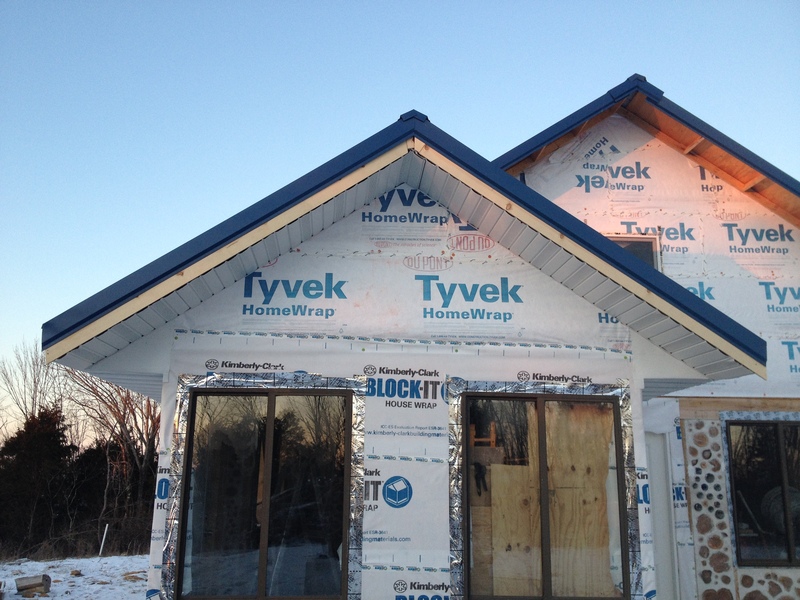 Hint: For those who have been asking about what will cover the Tyvek, you can see some of the cedar lap siding started in the picture above. That’s coming soon! The flashing came in boxes of 50-foot rolls. The metal, once unrolled, was just flat sheets, but they need to be bent at right angles on either side to fit over the roof line. For this, we borrowed a tool from my uncle to bend very long lengths of metal at once. 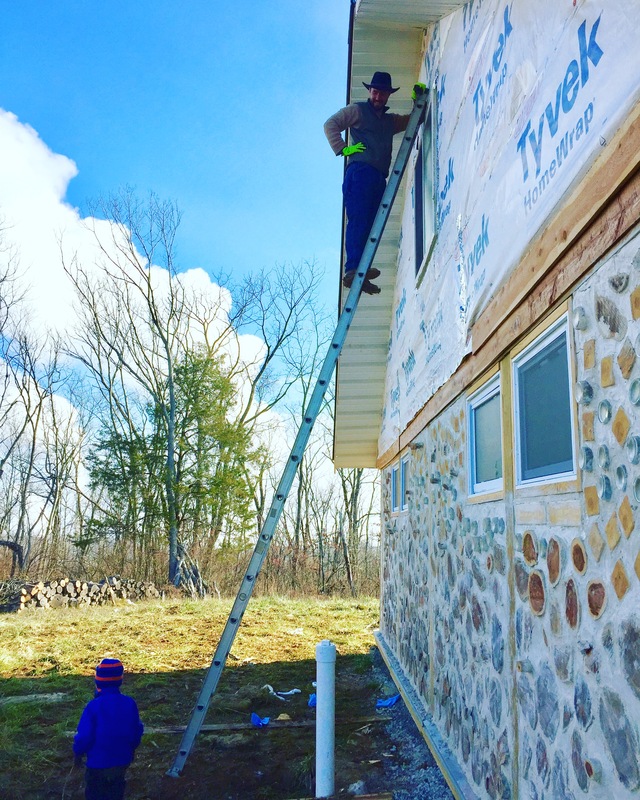 FYI, it was 78 degrees the day Mark finished the flashing. On February 24th! That’s just crazy for this area. We broke the record high for the day. 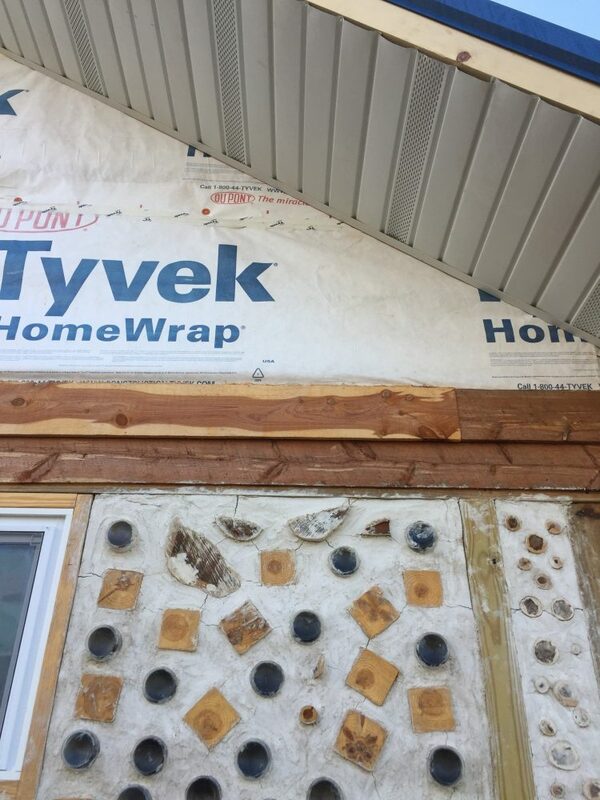 The next most pertinent thing is to get the cedar siding on the framed portions of the house. We’ve had a pile of this sitting around for several months now so we’re excited to finally get it up! Here’s hoping the incoming spring weather is cooperative. We’re heading into a really busy time for us in terms of our “day jobs”. We’re both music teachers heading into peak performance season with lots of concerts and musicals to play for. 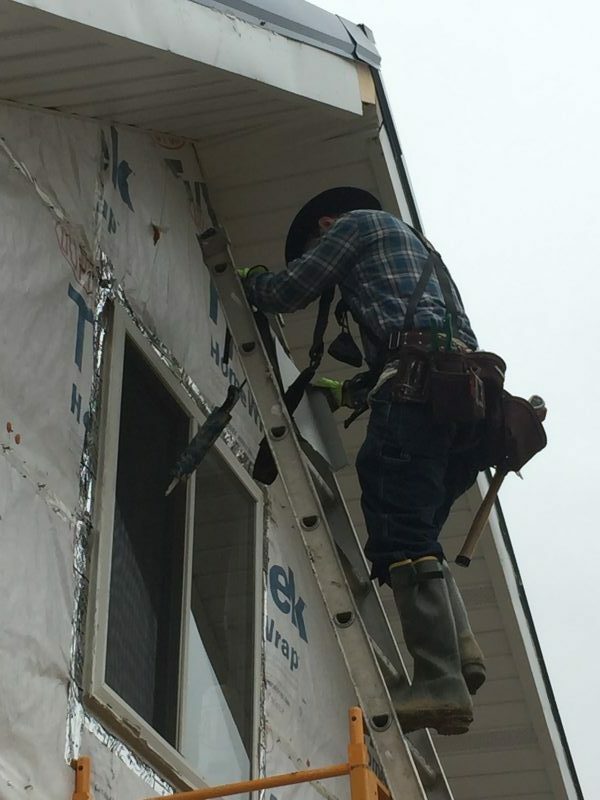 Will it take us away from working on the house? Sure, a little bit. But one of the great things about our jobs is that we’ll get loads of time to devote to the house over the summer, plus it’s income we can devote straight to the house to build debt free. If you’re someone who wants to build a house like we’re doing but you still need your job to provide the money to do it. don’t worry! If we can do it, so can YOU. 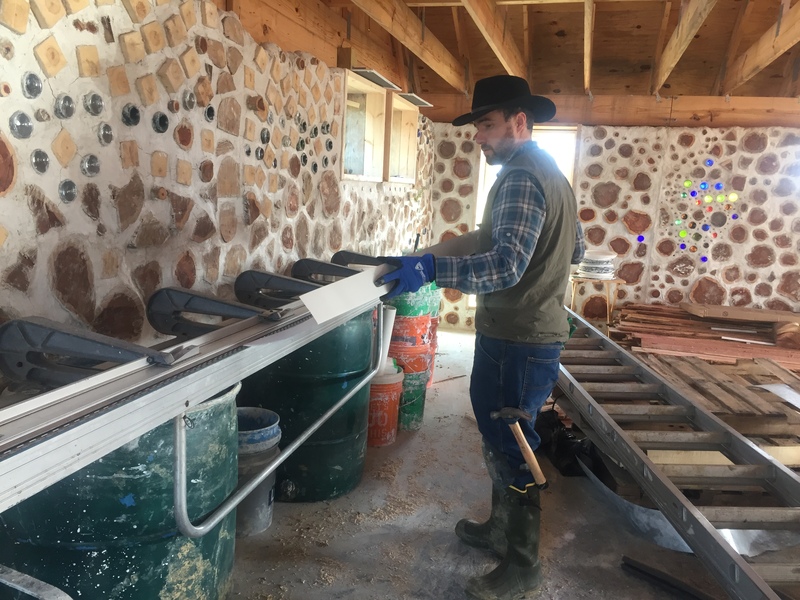 If you want to know more about our off-grid cordwood homestead project, click here. Like this content? Be sure to share it! 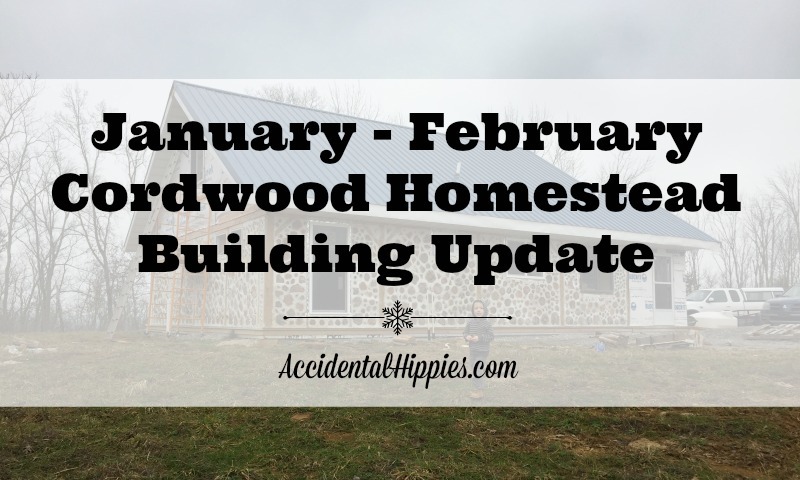 Join us on Pinterest, Facebook, and Instagram for more homesteading goodies that don’t necessarily make it to the blog. Thanks! Thanks! Every situation is so unique. I hope you can reach your countryside dreams one day, but until then enjoy each other in where you are. Good luck! Wow! This is so interesting! Y’all are so amazing. I don’t know if my husband and I could do what y’all are doing. So very impressive!